Hire car drivers warned to check their insurance this Christmas. Many excess policies fail to cover vehicles damaged within 150km of home. 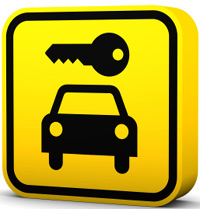 Hire car drivers planning to hire a car in the UK this Christmas are being urged to scrutinise the small print of their excess insurance policies to avoid being caught out if they are planning to drive the car from home. Leading provider iCarhireinsurance.com has found that the excess insurance offered by many providers fails to cover vehicles damaged within 150km of the customer�s home, even if the car was hired from within that distance. 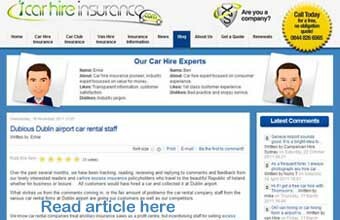 Most hire car drivers now understand that unless they purchase car hire insurance, they are liable for the excess of around �1,000 if the car is damaged, even if it is not their fault. However most don�t realise that they could buy this cover and still not be insured because of loop-holes in the small print. Many people will be hiring vehicles this Christmas to visit relatives and friends, and loading up the car from home with family, presents and luggage. 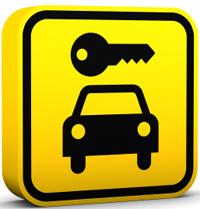 iCarhireinsurance.com is one of the few providers that covers drivers wanting to hire cars near their home. It also includes cover for damage to the windows, tyres, roof and undercarriage - vulnerable parts of the car excluded by many providers. 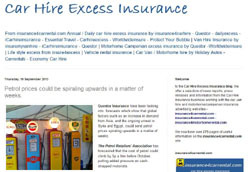 iCarhireinsurance.com's policies are not just comprehensive, they are good value. 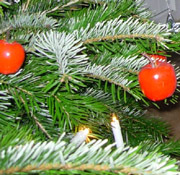 The European Excess policy is only �2.99 a day, so a family wanting to take a week�s break in the UK this festive period can have their excess covered for only �21. Customers planning to hire a car for their Christmas, Easter or summer break should consider the annual European Excess policy for only �39.99. This will cover them for driving anywhere in Europe, business or leisure, for the rest of the year. Most rental desks will cover you for driving within 150km of home, but charge around �9.99 a day for excess insurance, so �70 for a week�s cover.